Joe will cover such things as groove, technique, dynamics, stage presence, marketing, promotion, endorsements & booking gigs. 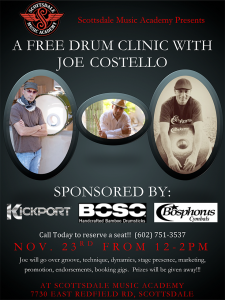 "drums at any age", "Joe Costello", "not too old to learn", bamboo drum sticks, boso drumsticks, bosphorus cymbals, drum lessons, drum products, Drummer, drums, endorsements, Free Clinic, goals, kickport, music, passion, Scottsdale Music Academy, session drummer, touring drumemr. Bookmark.